The box score stats do not accurately reflect the performances of the Buffalo quarterbacks against Cleveland. A.J. McCarron completed three of six passes for just 12 yards but his first pass of the game was a beautifully placed deep ball dropped by Kelvin Benjamin. Nathan Peterman had a solid night statistically, as he completed eight of 10 passes for 113 yards and a TD, but his first throw was worthy of a pick six. Running back Marcus Murphy made the most of his four carries, rushing for 39 yards. His best play of the night was a 22-yard run in the second quarter. After receiving the handoff from quarterback Josh Allen, Murphy hesitated in the backfield, which caused the defenders playing contain to bite on Allen’s read option fake and then Murphy sprinted up the sideline for the big gain. Cleveland’s lone deep safety was all that prevented a TD. There weren’t many standout performances on defense. Even so, the Bills defense continually came up big in important situations. They forced eight punts, with six being three-and-outs, and stuffed Cleveland in a goal to go situation, forcing a field goal. The Bills played solid pass defense overall, limiting the big plays allowed. In the second half, they broke up a combined three passes and batted down another. Breon Borders also forced the receiver out on an end zone fade to prevent a touchdown, even if the Browns did end up scoring the following play. With the Cleveland starting QB competition underway, Tyrod Taylor didn’t do much when on the field. Some of that had to do with the Browns’ run game working so well, but Taylor also didn’t really test any throws downfield. Baker Mayfield had a decent outing as he protected the ball and made a few nice plays with both his arm and his feet. The Browns’ backfield is shaping up to be a solid group. Carlos Hyde had a few big runs on the night, while Duke Johnson served as the change of pace back, showcasing his versatility out of the backfield. Rookie Nick Chubb was also impressive, showing the ability to make defenders miss on some punishing runs. Edge defender Myles Garrett only played during the first quarter, but he had a strong performance, playing well against both the run and the pass. Garrett dominated Bills left tackle Dion Dawkins, demonstrating an ability to blow by him with quickness or walk him backwards with a bullrush. On the first play of Buffalo’s third drive, Garrett blew by Dawkins and would have recorded a safety if not for a sharp cut by LeSean McCoy. 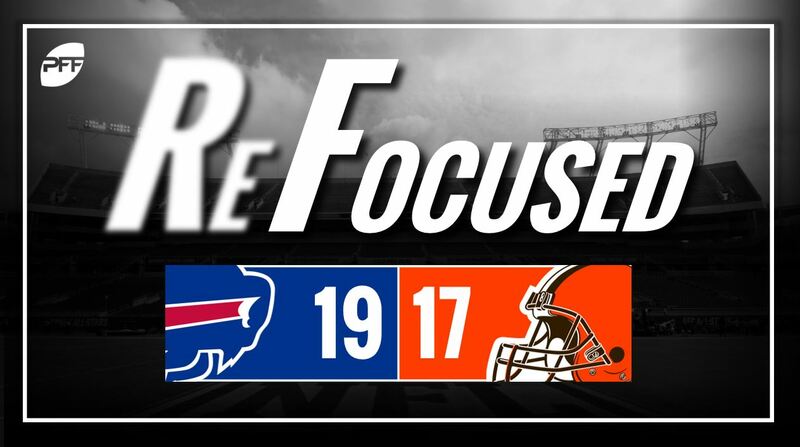 Cleveland’s first-string defense was impressive in the opening quarter, forcing Buffalo to punt four times without surrendering a single first down. However, during the remainder of the game the defense only forced the Bills to punt twice and featured an ineffective pass rush. Beyond Garrett, the Browns struggled to create pressure without blitzing. Buffalo: The Bills quarterbacks had more good plays than bad, managing to string enough good plays together to score touchdowns. However, if the Bills are going to continue to win, they will need more consistency from the signal caller, whoever that may be. Cleveland: Despite the loss, the Browns run game flashed promise, considerably more effective than last week’s showing.